Firm Foundation Home Inspections Inc.
Firm Foundation Home Inspections Inc. home Inspections are designed to meet and usually exceed the Standard of Practice of the International Association of Certified Home Inspectors. Complete Home Inspection including structures, major systems, finish elements and grounds. Detailed on-the-spot inspection report. No waiting for a report. Follow-up service. Just call with questions about your new home. In order to expedite your home purchase, Firm Foundation home inspectors are available any day of the year. To schedule home inspections, just call (321) 624-0254 any time, and we'll be glad to schedule a Firm Foundation Home Inspection at your convenience. Buying a new home is difficult at best, and can be downright painful. The complexities of title, deeds and financing are overwhelming. But your biggest concern is that you get what you pay for -- that your new home is in good condition and that there are no hidden defects that will haunt you after settlement. Firm Foundation Home Inspections Inc. offers a complete, quick, and thorough report that arms you with the facts you need before finalizing your contract and going to settlement. 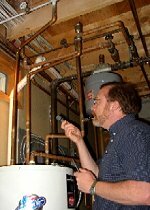 Your Firm Foundation Home Inspections Inc. report pays dividends long after settlement. Even if your home is in perfect condition when you move in, there are so many things you need to know to keep it that way. So many simple things that can be done quickly and easily, but if neglected can lead to major repair bills and inconvenience down the road. Firm Foundation Home Inspections Inc. inspectors educate you thoroughly about the structure and systems that make up your home. And the customized report you'll receive is a virtual homeowner's manual, with guidelines, checklists and reminders to help you remember when to do what to maintain your home. And don't forget our exclusive home protection follow-up service. Call your personal Firm Foundation home inspector any time with questions you may have about your home. Firm Foundation home Inspections include in-depth analysis and on-the-spot report detailing the condition of your home. You'll not only get the facts you need to feel confident about your purchase decision, but you'll also receive useful and practical information about how to care for your new home and protect your investment. Firm Foundation home inspectors performs a thorough examination of your home's structure, basement, heating, cooling, plumbing, electrical, bathrooms, kitchen, interior, exterior, attic, roofing, and grounds. Services available from Firm Foundation Home Inspections Inc. include 4 Point Inspections, Wind Mitigation Inspections and Maintenance Inspections.